Compact, efficient, durable. Reduces harmful organisms for a healthier aquarium. 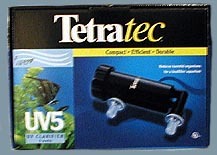 Ideally suited for both freshwater and saltwater aquariums, the Tetratec UV Clarifier is designed to be attached to a powerhead, water pump or canister filter with a maximum flow rate of 300 gph. 100 gallon maximum aquarium size.